[SatNews] “The Atlas V rocket, integrated with a Delta program third stage, launched this baby grand piano sized spacecraft at more than 36,000 miles per hour, making it the fastest object to be launched from Earth..."
An Atlas V rocket successfully launched the Pluto New Horizons spacecraft for NASA on January 19, 2006. The New Horizons spacecraft has traveled more than nine years and three billion miles for today’s historic flyby of the dwarf planet, Pluto. New Horizons was the inaugural flight of the Atlas V 551, launched by Lockheed Martin Space Systems Company, prior to ULA’s formation in December 2006. This mission was launched aboard an Atlas V 551 configuration vehicle, which includes a 5-meter diameter payload fairing along with five Aerojet Rocketdyne solid rocket motors attached to the Atlas booster. The Atlas booster for this mission was powered by the RD AMROSS RD-180 engine and the Centaur upper stage was powered by the Aerojet Rocketdyne RL10A engine. This mission used a Boeing third stage, which was originally developed for the Delta II program. This was the first and only use of this third stage on an Atlas rocket. The Boeing third stage provided the increased energy needed for the high performance requirements of this mission. New Horizons seeks to understand where Pluto and its moons fit in with the other objects in the solar system. The purpose of the Pluto New Horizons mission is to understand the formation of the Pluto system, the Kuiper Belt and the transformation of the early Solar System. 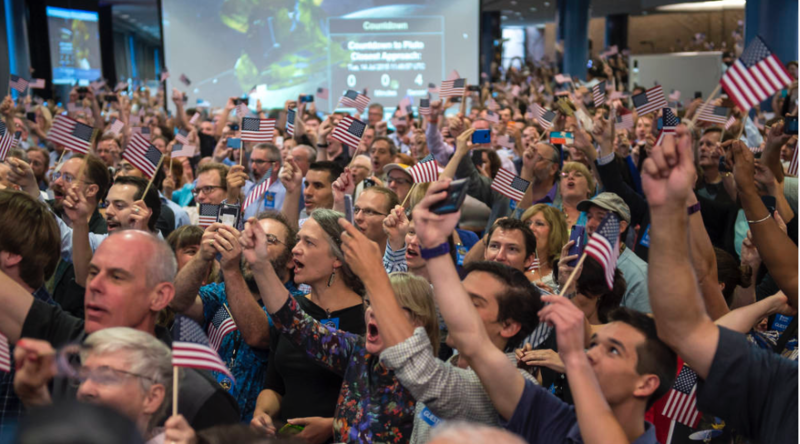 The spacecraft will study the atmospheres, surfaces, interiors and environments of Pluto and its moons. It will also study other objects in the Kuiper Belt. 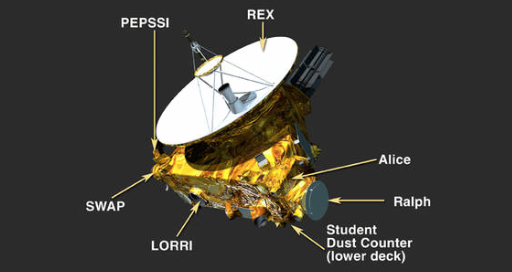 The New Horizons team selected instruments that not only would directly measure NASA's items of interest, but also provide backup to other instruments on the spacecraft should one fail during the mission. Alice: Ultraviolet imaging spectrometer; analyzes composition and structure of Pluto's atmosphere and looks for atmospheres around Charon and Kuiper Belt Objects (KBOs). LORRI: (Long Range Reconnaissance Imager) telescopic camera; obtains encounter data at long distances, maps Pluto's farside and provides high resolution geologic data. SWAP: (Solar Wind Around Pluto) Solar wind and plasma spectrometer; measures atmospheric "escape rate" and observes Pluto's interaction with solar wind. PEPSSI: (Pluto Energetic Particle Spectrometer Science Investigation) Energetic particle spectrometer; measures the composition and density of plasma (ions) escaping from Pluto's atmosphere.